What do cracks, scaling, pitting, sinking, hot tires and moisture have in common? 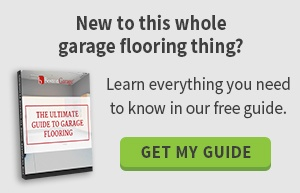 - They are all potential problems and hazards for a garage floor. Remember, garage floors take a beating and nowadays, garages are another space, an extension of our home. Cracks are the number one problem with concrete. It is only a matter of time before the concrete floor will have cracks, especially with such fluctuations in the temperature. You can treat a crack but if you do not properly prepare the surface, it will only make them look worse. Hot tires can be a problem. Simply pulling in the garage to park the car can melt or even peel the paint. This not only is unpleasing to the eye but can cause other problems as well. If the paint peels, the concrete is now exposed which can lead to cracks, allowing for harmful contaminants to seep in below the surface of the garage floor. Moisture is another problem and is impossible to avoid. Moisture vapor seeps from the ground and up thru the concrete potentially cracking the paint, what a waste of money and time spent painting the floor - another reason not to use paint! Scaling and pitting is a problem and is bound to happen over time. From environmental factors such as rain, salt, snow, moisture and the home settling to wear and tear such as parking the car on it; remember, hot tires are a killer to garage floors and not to mention children using it as a playground; constantly running in and out, riding their bikes, throwing down their hockey equipment and so forth. 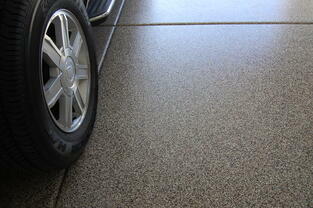 As previously mentioned, paint peels and is therefore he ideal material for a garage floor. Especially with the variations in temperature; hot tires in the summer, moisture vapor throughout the year and snow and salt in the winter. 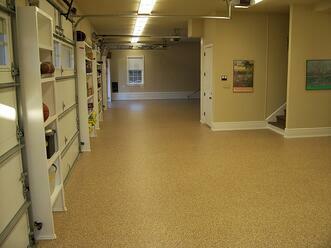 An epoxy floor coating is the way to go and for many reasons. Not only are there numerous colors to choose from, whether it be a solid color or a flake combination( there are hundreds to choose from) but it is aesthetically pleasing to the eye. An epoxy floor, if prepared properly by a professional has longevity, is durable, and slip resistant. An epoxy floor is safe, aesthetically pleasing and cost effective. There is a proper fix to all the above problems. It takes someone with the proper training, knowledge and material for the task(s) at hand. Remember, it is crucial to properly prepare the surface – hire a professional!